Officers were called at around 6.50pm to a property close to Tillingbourne Road in response to a report that a man entered a house and had a confrontation with a female occupant. He then fled the scene. Detective Sergeant Mark Butterworth of Guildford Criminal Investigation Department said: “This is a disturbing burglary; however I would like to reassure the public that we are working to identify the person involved. "We will be running extra patrols in the area to provide reassurance. "We are pursuing several lines of enquiry at present, but I would urge any members of the public with additional information to get in touch with us. Officers will be in Shalford tonight (14 February) to provide community reassurance and also to conduct enquiries. 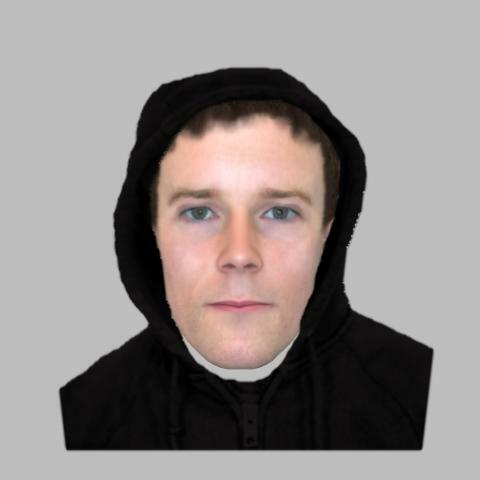 If you recognise the man in this e-fit, please call Surrey Police on 101 (999 in emergency), or tell us online via or http://surrey.police.uk/TellUsMore , quoting reference PR/45190013871.